You will find here relevant information on GeoSubSight, who we are, our areas of expertise, our background, as well as several examples of R&D studies we completed for our clients. We also offer consulting and training services. To keep track of your visit, feel free to download our 4-pages information brochure (7.2 Mb). 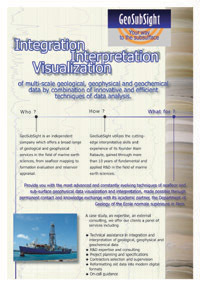 You can contact us quickly and easily through this form or by email at contact_at_geosubsight.com (replace _at_ by @).